This is for a PolargraphSD v3.0, that’s based on the ESP32 microcontroller. I’ve switched to using PlatformIO with VSCode as a development environment for PolargraphSD. Although the Arduino IDE is ubiquitous, PlatformIO allows me to use a best-of-breed IDE like VSCode or Atom. I use VSCode because I had a couple of problems with Atom. PlatformIO is an extension that interfaces with microcontrollers, and manages libraries automatically in a more mature way than Arduino IDE. I will periodically include a compiled binary in the project, which you can use if you don’t want to go to the trouble of dealing with IDEs and source code and compiling it yourself. The project binaries folder (https://github.com/euphy/polargraph_server_polarshield_esp32/tree/master/binaries) contains four files which should be loaded into four memory addresses on the ESP32. 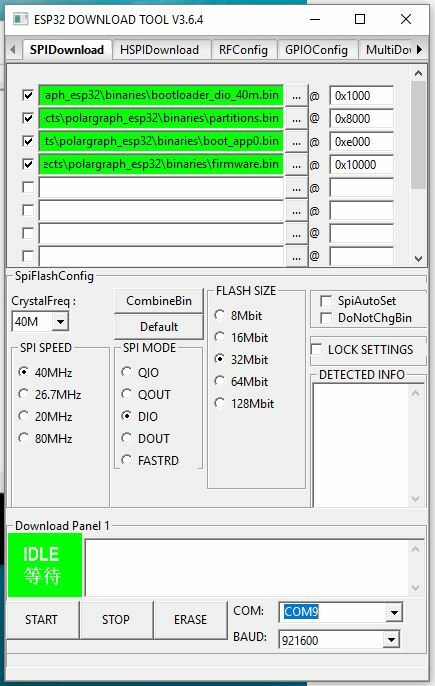 You can upload these files to the ESP32 that’s inside a PolargraphSD machine using a few methods. all on one line, and once you’ve changed COM9 to the name of your serial port. If it gets to the end of the line then it’ll time out. Try that a couple of times, but if it doesn’t take on it’s own, use a cocktail stick to hold down the little BOOT button next to the micro-USB connector, until it bumps into a upload mode. Press reset to get back running again! This entry was posted in machine, software by sandy. Bookmark the permalink. Hi Sandy, back in the game my friend after some time dealing with other creative project. 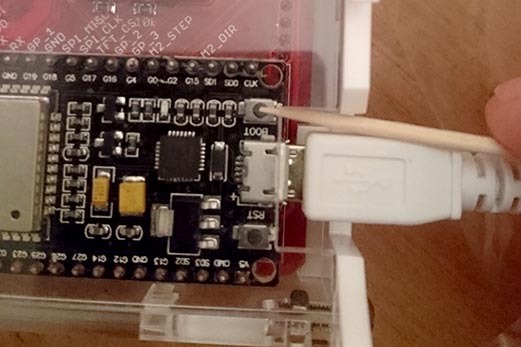 i’ve tried to update the new firmware on mine with the ESP32 tools, it always fails. It connect, the light on the controleur blink and the screen get white, and it fail. i’ve change the BAU to several value and do not solve the issue. My actual firmware version is 1.10 can it be a problem ? My Bad Andy i’ve found the issue as i dot not have the ESP32 version. I’ve update my shield to 1.4 what i think is the Higher version i can have on my polarshield V2.0. Now it is time to draw !